Epilation was reported among atomic bomb survivors in Hiroshima and Nagasaki, including “early entrance survivors” who entered the cities after the bombings. The absorbed dose to the skin by neutron-activated soil via β and γ rays has been estimated in a preliminary fashion, for these survivors in Hiroshima. Estimation was done for external exposures from activated soil on the ground as well as skin and hair contamination from activated soil particles, using the Monte Carlo radiation transport code MCNP-4C. Assuming 26 μm thickness of activated soil on the skin as an example, the skin dose was estimated to be about 0.8 Gy, for an exposure scenario that includes the first 7 days after the bombing at 1 m above the ground at the hypocenter. 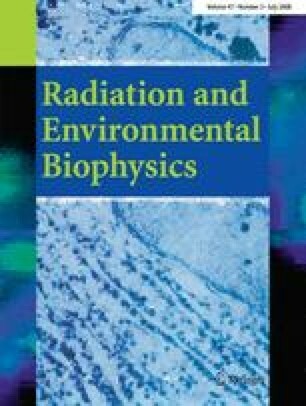 In this case, 99% of the total skin dose came from activated radionuclides in the soil, i.e., 0.19 and 0.63 Gy due to β and γ rays, respectively. In contrast, contribution to skin dose due to skin contamination with soil particles was found to be about 1%. To make it comparable to the exposure by neutron-activated soil on the ground, a soil thickness on the skin of about 1 mm would be required, which seems to be difficult to keep for a long time. Fifty-five percent of the 7-day skin dose was delivered during the first hour after the bombing. Our estimates of the skin dose are lower than the conventionally reported threshold of 2 Gy for epilation. It should be noted, however, that the possibility of more extreme exposure scenarios for example for entrants who received much heavier soil contamination on their skin cannot be excluded. Part of the present study was supported by Grant-in-Aid for Scientific Research from the Japan Society for the Promotion of Science under grant #15406002 and #17406001, awarded to Prof M. Hoshi, Hiroshima University. The authors express their sincere appreciation to Dr. Neil Whitehead, Mr. Kazuhide Kitagawa, Mr. Shinji Suga, and Mr. Shingo Sasatani, Hiroshima University, for their eager discussions.